“The place to be the Mission District, commonly called “The Mission”, is a neighborhood in San Francisco named after the oldest building of San Fran, which is located in the neighborhood. Numerous artistic and cultural institutions are based here. 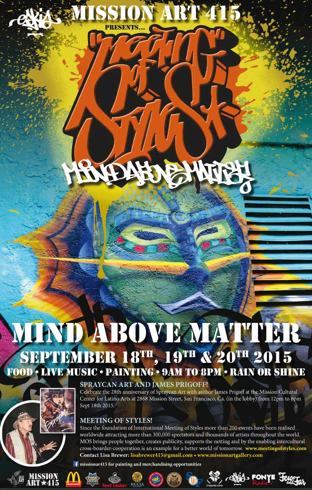 Mission Art 415 is proudly hosting the Meeting of Styles in San Francisco, from 10-8 daily, rain or shine. Mission Art 415 is celebrating the 28th anniversary of Spraycan Art with author James Prigoff at The Mission Cultural Center for Latino Arts September 18, from 12-6 with a meet and greet book signing along with a guest speaker panel consisting of Mark Bode, Cuba, Eon, Nate1, Crayone and Vogue. The Mission Cultural Center for Latino Art has been Mission Art 415’s fiscal sponsor since 2008. SF Mayor Ed Lee is the keynote speaker along with SFPD, SF Dept of Public Works and the Mission District 9 Supervisor David Campos and Street Art SF’s Jane Bregman”. This entry was posted on September 16, 2015 by hiphopbattlefield. It was filed under Uncategorized .